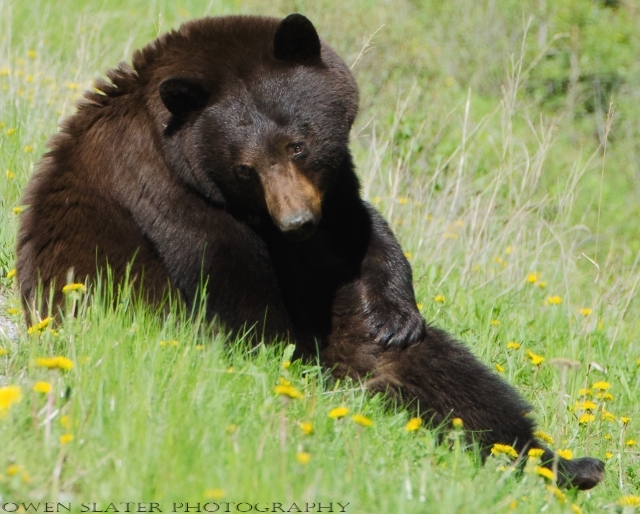 Even when taking a break from eating, thoughts of fresh dandelions never appears to be far from this bear’s mind! Not a particularly great photo due to the light and background but seeing bear cubs this small is pretty rare so I had to share. These three scrambled up a steep, rocky hill, using the exposed tree roots to pull themselves up to rejoin their mother feeding on the plants above. No bigger than a few pounds, they have a lot of growing to do! This is the sibling of the cub in the first photo. The mother kept them in the same area near the Waterton town site for several days so I was able to follow them from a safe distance for some time to get these photos. At one point this cub chased a squirrel up and around a tree. With the mother already across the road she went up on her back legs to check to see that her cubs were following. This black bear has her territory surrounding the Waterton townsite and over the course of two days I saw her wandering past the information centre, Prince of Whales hotel and Linnet Lake and she never once approached people despite numerous people getting too close to her on foot. This large adult male black bear was feeding on the last remaining berries of the season along the roadside in Waterton National Park. These two black bear cubs climbed up this tree while their mom slept on some of the bigger, stronger branches farther down the tree. By the time they were done they had broken off most of the branches, which fell down and were eaten by their mother who was woken up by a branch hitting her on the head.